Geneviève was proclaimed patron of French Security Forces. This was confirmed by Pope John XXIII in 1962. 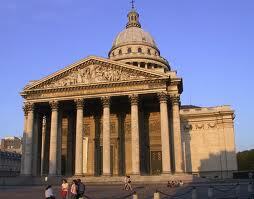 The Pantheon (image) is one of the most famous buildings in Paris. It was first built as the Church of Saints Peter and Paul in the fifth century. 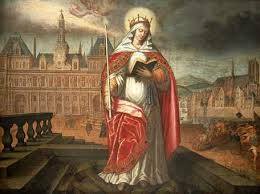 Because of her strong association with Paris, St Geneviève was buried there and it was later dedicated in her honour as the protectress and patroness of the city. Patrick Duffy tells her story. Born at Nanterre near Paris, Geneviève met St Germanus of Auxerre and confided in him her desire to live only for God. On the death of her parents she moved to Paris. Here at fifteen she received the veil from the bishop of Paris and lived a life of penance and works of charity. During the siege of Paris by Childeric and the Franks, Geneviève is said to have led an expedition to bring provisions up the River Seine from Troyes. In this she was an inspiration to other Parisians and she was honoured as the protrectress and patroness of the city. At her request they are said to have built a church in honour of St Denis (See 9th October). When Attila and the Huns were approaching the city, Geneviève assured the people of protection from heaven and persuaded the citizens to prepare by prayer and fasting. The Huns changed their route and turned towards Orleans and Paris was spared. Clovis I, the son of Childeric, also respected her and released prisoners at her request. She influenced him also to become a Christian and begin building the Church of SS Peter and Paul. It was here she was buried and the fame of the miracles worked at her tomb led to the church being called St Geneviève’s. In 1129 during a fever epidemic a casket containing the bones of the saint was carried in solemn procession to the cathedral. When Paris became capital of France, devotion to her grew and her church was rebuilt in the neo-classical style. It was secularised and called the Pantheon, but devotion to her continued. Puvis de Chavannes painted frescoes of her life around the Pantheon in 1877, which still remain today. In times of drought, flooding and other disasters Geneviève is still invoked. For her part in assuring the safety of Paris, she was proclaimed patron of French Security Forces. This was confirmed by Pope John XXIII in 1962.